ate artistry and amazing technique. His orchestral appearances often feature not only the beloved masterpiece concerti by Tchaikovsky, Rachmaninov and Liszt, but also the equally brilliant ones by Paderewski, Rubinstein and Moszkowski. Additionally in the "Pops" genre, Thomas' critically acclaimed performances of Rhapsody in Blue (Gershwin), Concerto in F (Gershwin), Warsaw Concerto (Addinsell) and the James Bond Concerto (Proctor) are immensely popular. Among his engagements during the 2015-16 season, were as guest soloist with The National Philharmonic, Ohio Valley Symphony, North Charleston Pops, Cheyenne Symphony, Maryland Symphony, Alexandria Symphony, Symphonicity, Amadeus Orchestra, McLean Orchestra and Frederick Symphony. During 2016-17, he will also be guest soloist with The Paducah Symphony, The Charlotte Symphony (FL), The Washington Metropolitan Philharmonic, The Amadeus Orchestra, The Tiraspol Philharmonic, The Alexandria Symphony, and The Maryland Symphony at The Garrett Lakes Arts Festival. Thomas will also be the Artist in Residence at The Black Rock Center for the Arts in Maryland during this season, and his recital touring schedule will take him to 20 states including New Mexico, Kentucky, Indiana, Arkansas, Virginia, Maryland, South Carolina, the District of Columbia, Georgia, Florida, Connecticut, New Jersey, North Carolina, Idaho, Pennsylvania, Tennessee, Oregon, Montana, Ohio and New Hampshire. Thomas' international concerts have carried him across the globe to China and Europe; last season, he also made his Canadian debut in British Columbia. Thomas has collaborated with conductors such as Piotr Gajewski, Dimitru Goia, Sabin Pautza, Emil Seigbert Maxim, Peter Schmelzer, Mihail Agafita, Grigori Moseico, David Russell Hulme, Andreas Delfs, Elizabeth Schulze, Miriam Burns, Sebrina Alfonso, Nicholas Palmer, William Intrilligator, Kim Allen Kluge, Robert Hart Baker, Crafton Beck, Ray Fowler, Glenn Quader, Scott Wood, Lawrence Rapchak, Gordon Johnson and Raffaele Ponti. An outstanding cross-over artist, Thomas Pandolfi's virtuoso transcriptions of the music of Andrew Lloyd Webber and Marvin Hamlisch are much in demand. For the 2016-17 season, he is offering further such transcriptions in unique programs entitled "Burt, Barry and Beyond" (the music of Burt Bacharach and Barry Manilow) and "Somewhere Tonight in America: A 20th Century Celebration", including a magnificent transcription of Leonard Bernstein's "West Side Story." British composer, Simon Proctor, has also written a "Sinatra Piano Concerto" for Thomas, which coincided with the 100th birthday celebration of Mr. Sinatra during last season, and a brand new "Andrew Lloyd Webber Concerto", also for Thomas. Following a violin concerto for Midori, and a saxophone concerto for Brandford Marsalis, film and concert composers Kim Allen Kluge and Kathryn Vassar Kluge composed The American Piano Concerto for Thomas, which was an absolutely smashing success at its world premiere in May 2016 with Thomas as soloist, co-composer Kim Kluge on the podium and The Alexandria Symphony. 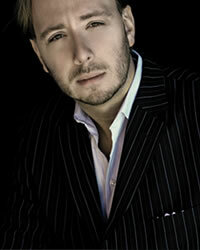 A graduate of The Juilliard School, Pandolfi earned both his Bachelor's and Master's degrees as a scholarship student. He is the proud father of a wonderful son and daughter, and resides in Washington, DC.